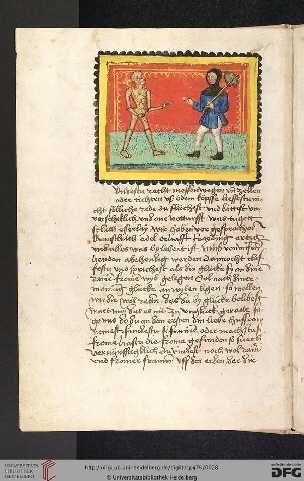 „Death and the Ploughman“ Johannes von Saaz and a dialogue with Judaism ? .In Saaz was – probably in 1401 – created a literary work which belongs to the highlights of rhetoric and literature of medieval Europe. It was the dialogue Der Ackermann aus Böhmen, or Der Ackermann und der Tod (Death and the Ploughman). In the Czech literary studies was the author known as the John of Saaz, in German literary guides is still used the appearance Johannes von Saaz. In Saaz he was known probably before the year 1378 as a public notary (notarius civitatis) and from the eighties he worked as urban school director (rector scholarium); both functions, he did for several decades simultaneously. He belonged to a wealthy and respected citizens of the Saaz city and lived there until 1411. In this year he moved to Prague, where he became a notary in the New Town Hall. 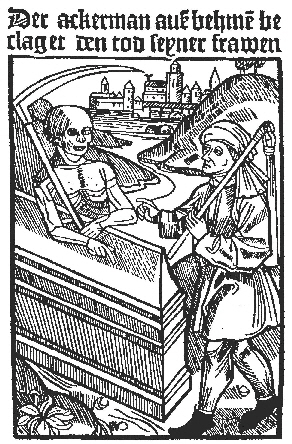 In Prague he fell ill, however, fairly early in the spring of 1413. He died in 1413 or 1414. Jan owned in Saaz properties and probably traded with Jews in Saaz, who has already been found, as you can see from written records. There were also a blended families as it is known from the baptism of one Saaz Jewish women from 1376 which converted due to intermarriage with Christians. Jews in the country spoke mostly German and were part of the culture in the Kingdom Czech (Bohemia). Looking for dialogue with Christians as f.e. tried the known Prague Rabbi Avigdor Kara-ben Isak in his poem „Almekhtige Got Einig un eiyn“ (and only God Almighty) where he argued against the Christian dogma of the Trinity of God. 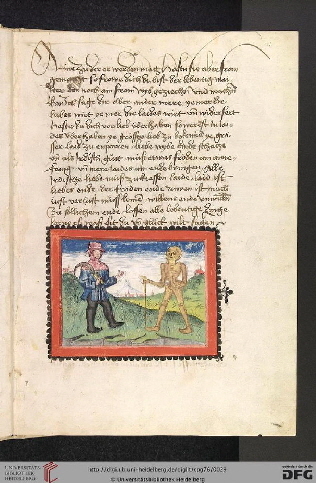 The specialist in German studies, Albrecht Hausmann, believes that John of Saaz had through Rabbi Avidgor connection with the Prague Jewish intellectual life and, therefore he wrote for this group his book „Death and the Ploughman“. In his work he avoids any mention of Christ and his whole work of salvation, even replaces the Apostle Paul by King Solomon, and years counted from the creation of the world according to the Jewish calendar. In his work on the Ploughman he shows us the core of the dispute between Jews and Christians in the Middle Ages. Death as it is characterized here it is the opposite of Christ and is all-in-all non-Christian, and according to the Old Testament era, it does not know the Christ. According to Hausmann he demonstrates the importance stems from the renunciation of Christ as the Son of God as a savior. Without God‘s son he stands between God and man only inpersonal, amoral and destructive principle of death. Throughout the episode lacks any reference to the New Testament. Contacts between Jews and Christians, despite great difficulties and pogrom in Prague in 1389, were quite friendly. The fact attest to complaints of Christian bishops in the Sermon on Wenceslas IV., Which is called the friend of the Jews. „All this still is not clearly documented, so we hope in the new research results,“ writes A. Hausmann. Like the Jewish influence to the Old Testament in ancient Greek philosophy.